Backed by a team of skilled professionals, we are actively engaged in offering our clients a vast assortment of Label Tapesfor Clothes that are used for packaging and sealing purpose. The provided tapes are available in diversified designs, thickness and specifications for our valuable clients to choose from. The offered label tapes are designed by our adroit professional use top notch quality raw material and innovative technology in sync with set industry norms. 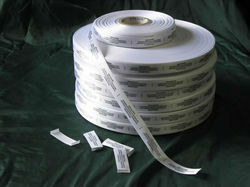 Looking for Label Tape for Clothes ?